SAP Business ByDesign OData services support two authentication protocols: Basic Authentication (user/password) and OAuth 2.0 SAML Bearer authentication. 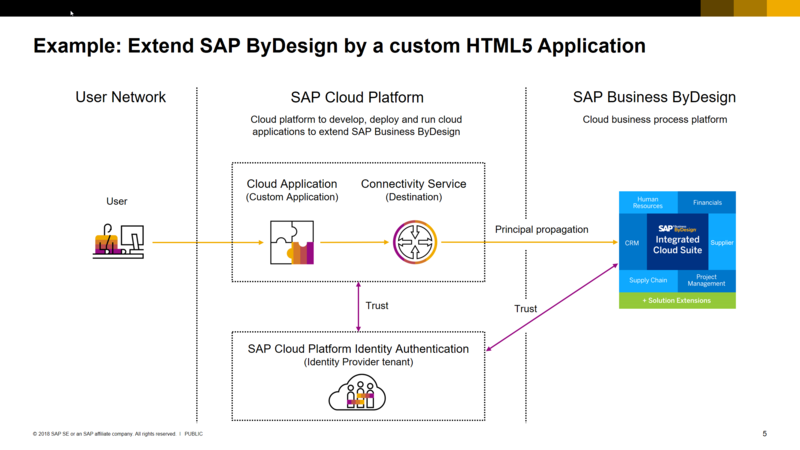 Combining frontend single sign-on and principal propagation using OAuth means you can extend SAP Business ByDesign (ByD) by SAP Cloud Platform HTML5 applications and automatically benefit from the role-based authorization management of ByD. As result you gain a great flexibility to extend ByD at low development costs to secure data stored in ByD. 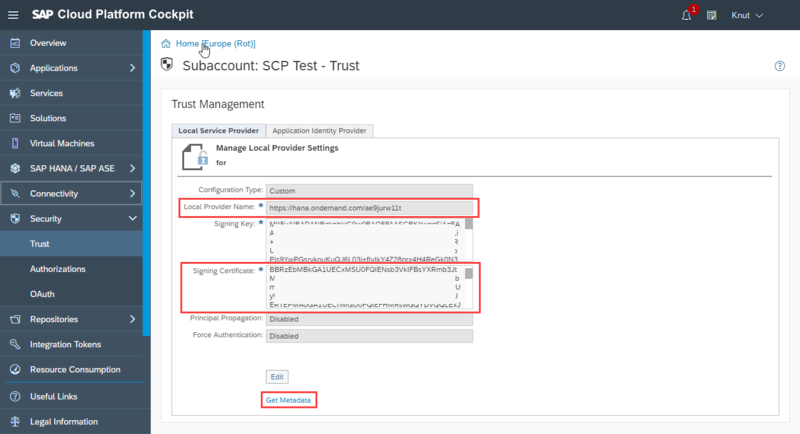 This blog posts provides an example to configure single sign-on and principal propagation using OAuth 2.0 SAML Bearer authentication between an HTML5 Application running on the SAP Cloud Platform (SCP) and SAP Business ByDesign (ByD) using OData services. Let’s assume we have an HTML5 Application running on the SAP Cloud Platform (SCP) to display and browse your company address book and allow employees to change their workplace address information. The HTML5 application is connected to SAP Business ByDesign as cloud ERP backend with all relevant employee data stored. Users shall be able to use the same logon credentials for the SCP HTML5 application as well as for SAP Business ByDesign using frontend single sign-on, and user propagation shall be used for any OData requests between the SCP application and ByD. In my blog post Extend SAP ByDesign using SAP Cloud Platform HTML5 Applications I explained how to setup an HTML5 Application running on the SAP Cloud Platform to extend SAP Business ByDesign. As first step we setup frontend single sign-on to use SAP Cloud Platform Identity Authentication as Identity provider for the HTML5 demo application. You can test single sign-on for your SCP HTML5 Application: Capture the Application URL of your SCP HTML5 application and open the URL in an incognito browser window. The browser should redirect you to the IDP logon screen for authentication and you should be able to successfully login to the SCP HTML5 application. 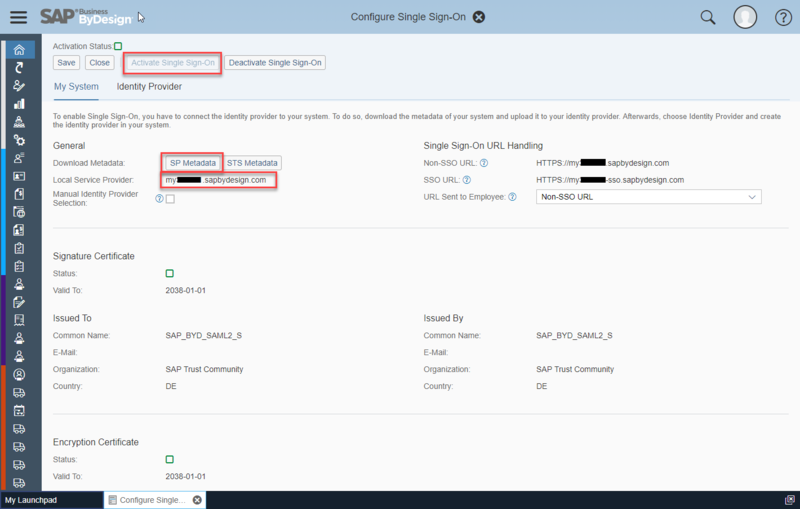 In step 2 we setup frontend single sign-on to use SAP Cloud Platform Identity Authentication as Identity provider for SAP Business ByDesign. You can login to the ByD tenant using single sign-on: Open the SSO-URL of your ByD tenant in an incognito browser window (for example “https://myXXXXXX-sso.sapbydesign.com”). The browser should redirect you to the IDP logon screen for authentication and you should be able to successfully login to ByD. Per default ByD uses the name ID format “unspecified” for user mapping. ByD maps the name ID of SAML-assertions on the ByD user alias. Additionally ByD support the name ID format “emailAddress“. In this case ByD maps the name ID of the SAM-assertion on the ByD user e-mail address that is specified in the ByD employee contact data. In step 1 and 2 we configured frontend single sign-on for SAP ByDesign and the SAP Cloud Platform application. Now we configure principal propagation such that the same user is used for OData access between the SCP application and ByD as well. Open SAP Cloud Platform Cockpit and navigate to HTML5 Applications: Open the HTML5 application and edit the destination mapping: enter your new OAuth destination as “Mapped Subaccount Destination”. The SCP HTML5 Application now uses user propagation for accessing ByD using the OData services. Open the Application URL of your HTML5 application in an incognito browser window: The browser should redirect you to the IDP logon screen for authentication (frontend single sign-on configured in step 1) and the role-based authorizations of your mapped ByD user should apply in the HTML5 application for read and write access to ByD (user propagation configured in step 3). In my example above I used a single SCP sub-account to develop and use the HTML5 appication. In this setup the SAP Cloud Platform consumer sub-account subscribes to the HTML5 application provided by the SAP Cloud Platform provider sub-account using SAP Cloud Platform Cockpit >> Application >> Subscription. In the subscription you get the Application URL and you have the possibility to map required destinations as described in step 3. 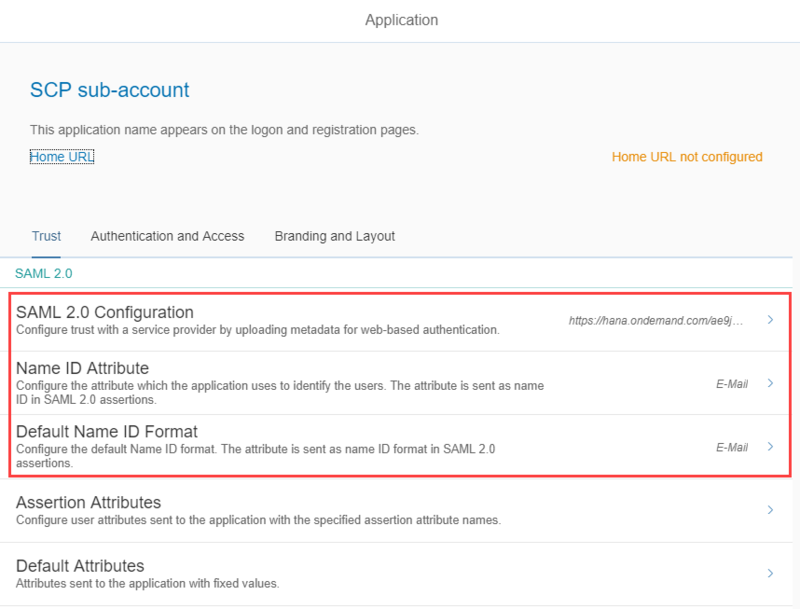 Furthemore frontend single sign-on and OAuth 2.0 SAML Bearer Authentication has to be configured in the SAP Cloud Platform consumer sub-account. I have a question related to that: Given a scenario in which not every user of the SCP HTML5 app has a user in ByD, would it also be possible to use a technical user in ByD instead of a business user when doing HTTP Basic Auth? ByD Soap services and OData for data sources can be consumed using technical users with basic authentication or client certificates. OData for business objects (the API I’m using in my example above) requires a ByD business user for authentication. Thanks for the great information on how the setup within the SAP Cloud Platform. I have a question is that other than this great example of setting up in SAP products, by chance you have any example of how the OAuth 2.0 can be setup with other applications or even interface, like Microsoft Office and etc.? I don’t have such an example myself, but maybe you find the example you are looking for in the communities of SAP Cloud Platform Identity Authentication or SAP Cloud Platform Security. Thank you for a great blog on the topic of configuring OAuth2.0. We have the exact same scenario, an HTLM5 app in SCP that connects to Odata structure in SAP ByD. We have SSO setup for SAP By Design via Azure and login with our email address. Should we still follow this blog or do you have a link to another blog that describes how to set this up?